Codementor Support - How do I use the request notification whitelist? All Categories ​>​ I&apos;m a Mentor ​>​ Mentor Basics ​>​ How do I use the request notification whitelist? Whitelist is a list of prioritized expertise tags you wish to receive notifications when a new request with tags from the list is added. Once you've added expertise tags to your whitelist, you'll only receive requests with expertise tags in your whitelist. 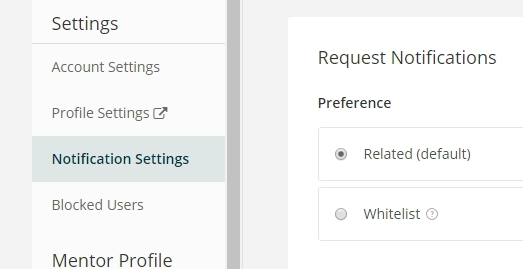 You won't receive any notifications for requests with tags not included in your whitelist. The default setting is to receive notifications from requests with any expertise tags from your profile. To add skill tags to your whitelist, simply edit them in your Notification Settings. This can be accessed from Settings in the Dashboard. Clicking on the radio button beside Whitelist will allow you to add expertise tags, so you will receive notifications with those tags. You can also switch back to the default setting at any time by clicking "Related (default)."